Up until the early 1900’s most developmental psychologists believed that heredity was the sole factor in determining intelligence. They believed that a persons’ intelligence was genetically predetermined and environmental factors played no additional role in brain development. Research states that infants’ brains at birth are equipped with most of the brain cells they will ever have; however, it is now believed that connections or pathways between these cells must develop to help them think and learn. Scientists and developmental psychologists now know that a child’s life experiences (including what he sees, hears, and touches), can help develop these brain pathways. It is also believed that there is a definite “window of opportunity” to develop these pathways. If they are not formed due to poor stimulation, the brain actually removes or “prunes” the unused connections. This begins to occur after the First year and continues until about age 12. This explains why children usually have an easier time than adults learning new things (i.e., languages, etc.). Developmental Psychologist Jean Piaget (1896-1980) was one of the most influential and well respected forces in the field of Child Development in the 20th century. He believed that the brain development of the child progresses from concrete to abstract thought. Sensorimotor Stage (birth–2 yrs)–Piaget’s First stage of Development. Piaget believed that in the first Two years the baby is limited to what he can acquire through his sensory perceptions and motor activities. 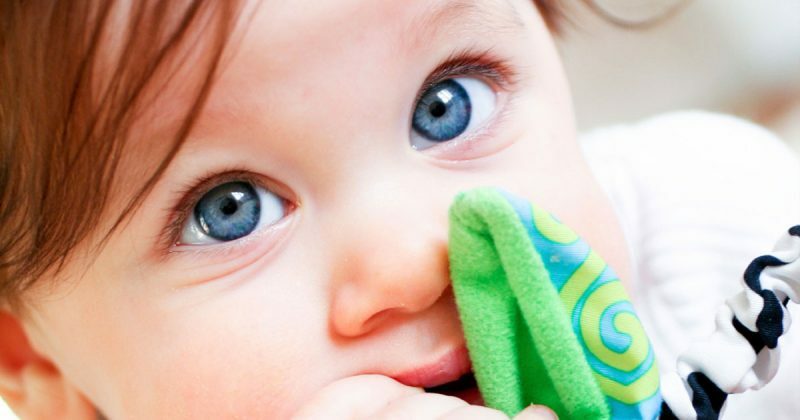 The sensory perceptions include visual (eyes), auditory (ears), and tactile (touch). Motor activity refers to the child’s ability to move and explore his world using both gross motor skills (large muscle development, i.e., moving arms, walking, jumping), and fine motor skills (small muscle development, i.e., grasping with fingers). As a parent, you are your child’s first teacher! Provide regular opportunities for him to explore, listen to music, and play with developmentally appropriate toys. Developmentally Appropriate toys for this age group should be both visually engaging and have various textures for tactile (touch) stimulation (important for brain development). In addition, toys that create noise when moved stimulate the baby’s auditory development (hearing) while simultaneously teaching cause and effect; i.e., baby learns that he can make the toy play music by pulling the string. Babies and young children should be feeling, shaking, throwing, pushing, pulling, rolling and stacking. I specifically remember the following scenario many years ago with my 13 month old son. We were at a friend’s house for play group and he looked out the window and pointed to their small shitzu dog running in the yard and said, “dog.” Up until then I was pretty sure he had only seen our large golden retriever and other large dogs. How, then, did he know that this tiny animal is also a dog? Well, let’s break it down. They both have long noses, walk on 4 legs and bark. He had made an accommodation to his already learned “dog schema” by comparing similarities of new and previously learned information. He believed as babies are exposed to situations they develop what he called “Schemas.” A schema is like a category or “memory” in the brain based on experience; i.e., dog. The baby assimilates “dog” into his previous understanding of animals – which means he incorporates the new information into his already existing knowledge (i.e., dog is an animal). The baby will then make adjustments to this schema as he becomes more familiar with it; ie., he may have only seen a large dog until now and now has added small dogs to his “dog” schema. Piaget called this process accommodation (i.e., both Golden Retrievers and Shitzus are dogs). I find this concept absolutely fascinating and it supports my belief that learning happens everywhere! Immerse your child in language by talking, singing and reading to him regularly. In addition, take him out into the world and see the delight in his eyes as he discovers and learns. Let him stack, shake, throw, push, pull, feel, move and explore! And above all… My wish for you… Enjoy your parenting journey with your little miracle as you watch him learn with delight!